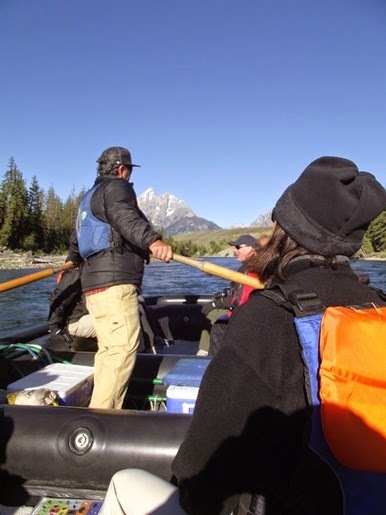 This past summer Kathy and I, along with a few friends, took the opportunity to float the Snake River through the heart of Jackson Hole in the Grand Tetons. I knew this was a fairly popular activity for many visitors, so my expectations were already set fairly high. However, our own personal experience that day exceeded those expectations - we had an absolutely great time. 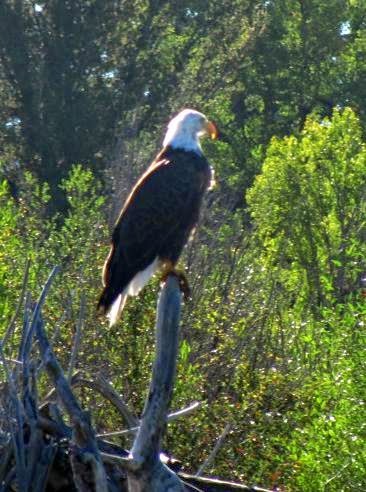 In addition to seeing some amazing scenery, one of my chief objectives was to see a variety of wildlife - especially bald eagles. Although we didn't see any mega-fauna, we did see several common mergansers, a couple of blue herons, an osprey, and six bald eagles - which happened to double the total number I've seen in my life! Although it was late August, the morning of our trip was unseasonably cold. We were all dressed in fleece, gloves and long pants. After launching from Deadman's Bar, located just south of the Cunningham Cabin, our raft took us all the way down to Moose Landing (at Moose Junction), a distance of roughly 10 miles. From its headwaters in Yellowstone National Park, to its confluence with the Columbia River in Kennewick, WA, the Snake River travels a total of 1078 miles. Along the way it flows though the Jackson Hole valley, the Snake River Canyon, Hells Canyon, and the rolling Palouse Hills of eastern Washington State. 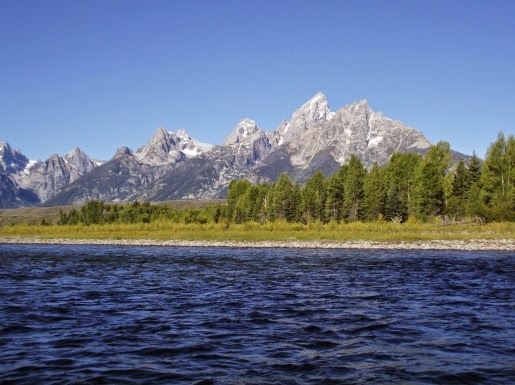 The drainage basin for the Snake encompasses parts of six states, while roughly 50 miles of the river passes though Grand Teton National Park. 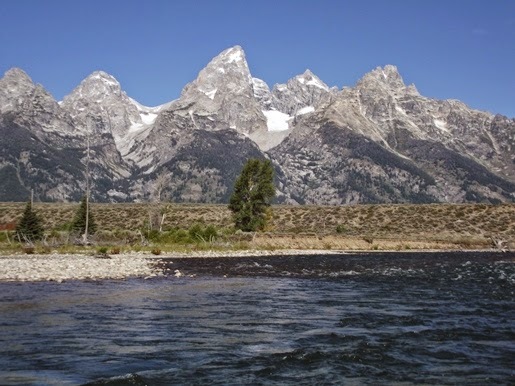 Grand Teton National Park is home to the greatest variety of wildlife in the lower 48 states. With its lush willows to feed on, deep-water pools to swim in, and groves of aspen, the Snake River offers park visitors one of the best chances for seeing wildlife, including bison, elk, moose, pronghorn, deer, bears, beaver, or maybe one of the more than 300 species of birds that live in or migrate to the park. 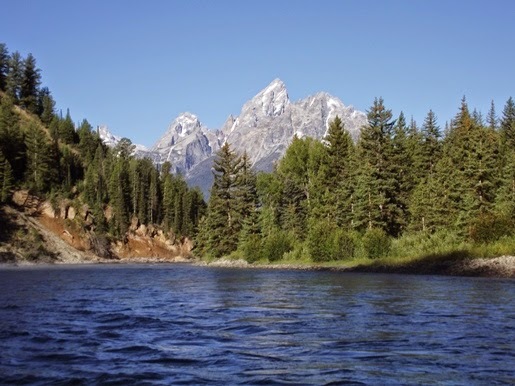 Rafters will also enjoy spectacular views of the entire Teton Range, including Grand Teton, the highest mountain in the park. The first documented ascent of the 13,770-foot peak occurred on August 11, 1898 by four climbers. Two members of the Hayden Geological Survey claimed to have reached the summit on July 29, 1872. However, that ascent is disputed by climbers and historians who have concluded, after studying the climber’s accounts, that the two reached a side peak known as The Enclosure. Moreover, the 1898 climbers found no evidence of a previous ascent, including a cairn which was a common practice for the expedition. 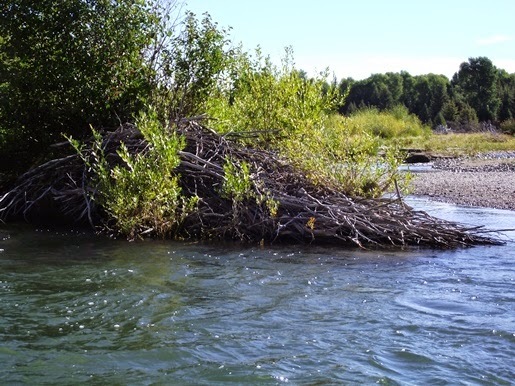 If you're lucky you may notice a beaver lodge or two along the river bank. Beaver were nearly trapped to extinction in Jackson Hole during the 1800s when beaver hats were in fashion. However, they've made a strong rebound over the years, and have re-established numerous colonies in the wetland habitats around the park. Roughly 8 miles downstream from the put-in at Deadman's Bar we passed a couple of cabins from the old Bar BC Dude Ranch. Established in 1912, the Bar BC was one of the first dude ranches in Jackson Hole. In 1985 Grand Teton National Park acquired the ranch, which was subsequently listed on the National Register of Historic Places five years later. As we approached the end of the trip we floated past Menors Ferry. 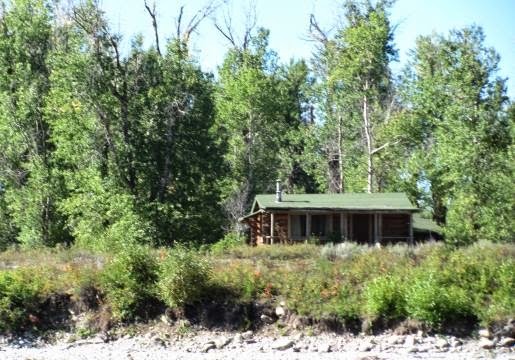 In 1894 Bill Menor came to Jackson Hole to set-up a homestead along the banks of the Snake River. 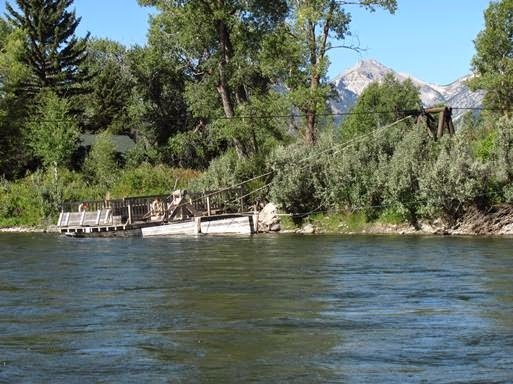 In addition to his cabin and general store, he constructed a ferry that became a vital crossing point for the early settlers in the Jackson Hole valley. He operated his ferry until 1918 before selling out to Maud Noble. The Menor Ferry is essentially a pontoon of two floats connected by a platform. This type of vessel is known as a "reaction ferry," which has a design that dates back to ancient times. The ferry uses the force of the river to propel the pontoon along a cable stretched across the river. The platform had sufficient room for a wagon and four-horse team. Menor charged 50 cents for a wagon and team, 25 cents for a horse and rider, but was free for pedestrians if a wagon was already crossing. The current ferry and cable system on the site today is a replica of the original. All in all we had a great adventure. It was likely the best raft/float trip I've ever taken. Our outfitter was Barker-Ewing Scenic Tours, who did an absolutely outstanding job, and would recommend to anyone who was considering a similar trip. Most trips take about 2.5 to 3 hours. Morning and evening trips will be the best times for spotting wildlife, while mornings will offer the best views of the mountains.